We offer two printing techniques: screen and digital printing. Each technique suits a specific artwork: 1) If your logo or message contains up to three colours, the screen printing technique is the better option. 2) If you want to print a picture or a photograph, then digital printing is right for you. Considering the ink colours, you can choose your desired Pantone colours. This means we will try to match our ink colours as closely as possible with the Pantone colours used in your logo. For safety and health reasons, we use lead-free ink. Our promotional gifts are produced without any ozone-aggressive CFC's. More material information and safety certificates are available on request. Note: We always mention our copyrights and puzzle model on one side of the puzzle frame. Screen printing is a method of creating an image by pressing ink through a screen (or mesh) with areas blocked off by a stencil. Each colour is printed separately. 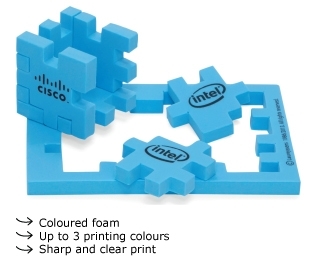 With this technique you can print your logo on white or coloured foam. We can print up to four colours using the screen printing technique. Starting from four colours the digital print is more cost-efficient for you. Provide at least 2 mm spacing between colours, which will avoid the colours from mixing. Details smaller than 2 mm partly dissapear and will not be clear enough on the foam. It is apparent that the result is artwork specific. The used colours are an important factor. For example, if your design includes the colours yellow and blue, that don’t have a 2 mm space between them, the overlapping parts could turn out green. However, if your logo includes the colours yellow and black, the print will turn out clearer defined. How to supply your artwork? Please place your design on one of the templates we provide on our website and send it to us. The file should be a print-ready version and should be delivered as a vector file in .eps or .pdf. Let your designer know that he has to ‘outline’ the text before sending it, in order to avoid lay-out changes during the sending. Digital printing is the ideal printing technique for digital photos and colourful designs, which have different shades of colour. 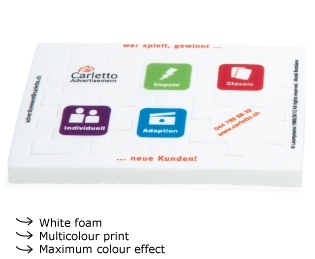 We prefer to print the digital artwork on a white foam surface to have a maximum colour effect. The brightest effect is realized when using 100% colours (eg. CMYK: 100%) and not a mix of colours or a colour mixed with black. Since we print on white foam, no white inkt is used in the digital print process. White areas in the design must therefore be drawn up as a translucent area. Details smaller than 2 mm disapear and can create misty spots as result. It is apparent that the result is artwork specific. Used colours and details are an important factor. For example, if your design includes a lot of different colours, the result can be blurry. If your design has a limited number of separate colours, your print will be more vivid. The first option is to send it as a raster-file in .pdf or .jpeg with a resolution of 300 ppi in RGB. The file should have the exact dimensions (for a 100%) of the final product. The second option is to send it as a vector-file in .eps, .pdf or .ai (saved in Illustrator CS4). This last option will give you the best print result. Drawings should always be saved as vector-files. Digital images should always be saved as a .jpeg and should be in RGB colour format.